Let’s start with a little disclaimer about crystal healing: most of the claims are a little far-fetched. But that, along with the fact that crystals are really pretty to look at, is part of what makes them so fun. While I’m not going to argue that crystal vibrations have a scientific basis here, I can attest that decorating with gems can be a delightful and energizing hobby. If you enjoy wearing or decorating with crystals, you’re probably already familiar with the concept of vibrations. 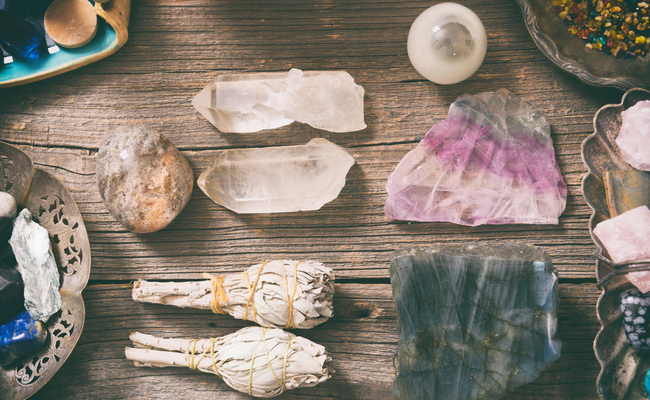 According to crystal healing aficionados, crystals vibrate at various frequencies, affecting the spaces and people they come into contact with. From this logic follows that certain crystals have properties that allow them to heal, bring joy, increase relaxation, increase energy, or encourage self-love (among other things). With all that said, if you want to make your home a friendly, energetically positive space in which to live, here are five crystals you might want to consider adding into your home decor. Rose quartz is one of the most popular crystals out there. That’s because it is great for addressing a problem that leaves many people feeling negative: Problems with self-love. Rose quartz is all about love, self-care and compassion. Use it throughout your home to help heal old wounds so that you can embrace each day with open arms. Rather than giving off healing and positivity, onyx is an absorptive crystal. It helps to absorb all manner of negative energy, leaving your home environment a much more positive place. Citrine is a gorgeous yellow stone, which is appropriate, as it’s known for spreading sunshine and happiness. It is said of citrine that it helps people embrace a childlike attitude toward life, leaving them happier and more carefree. Similar to onyx, bronzite can be used to protect against negativity. It can repel negative energies and rudeness, while imbuing a sense of calm that can help resolve old negative emotions. Celestite is a gorgeous light-blue stone that is said to be an angelic crystal. In that vein, it is perfect for those who have an affinity for angels. Decorating your home with celestite can help you feel a connection to all things angelic, and allow you to feel more creative and relaxed in your daily activities.